Candy for Troops & First Responders – Each year after Halloween Roscomare sends candy to Troops and First Responders through Operation Gratitude. Last month we once again donated and are awaiting our final tally of how much… but it was a lot! In November 2017 – we donated 250 pounds of Candy – way to go Roscomare kids! Some children include letter to the troops, you can do that too. Some classes will be writing letters of appreciation and including them in the box. To learn more about this great organization, click here. Volunteer League – Volunteer League is currently the only non-profit that provides clothing needs to LAUSD children K-12 and LAUSD Homeless Ed Department middle and high school students. Children are referred to the Volunteer League by school nurses, social workers, principals, and counselors. Friends of Roscomare donates to this organization several times throughout the year through our lost and found. Our last donation was at the end of the 2017/18 school year. And our next donation will be on Friday, December 7th 2018. To learn more about the Volunteer League click here. Toy Drive – every year our Student Council organizes a Toy Drive before the winter holidays, bringing new toys to underprivileged children in the community. It’s time to drop off new unwrapped toys in the office. The deadline to bring them in is Thursday December 13th, 2018… on December 14th, our local Fire Department will be picking them up. Click here for the flyer. Book Drive – the Student Council organized a book drive in 2017 collecting new or gently-used books for needy students in elementary schools. 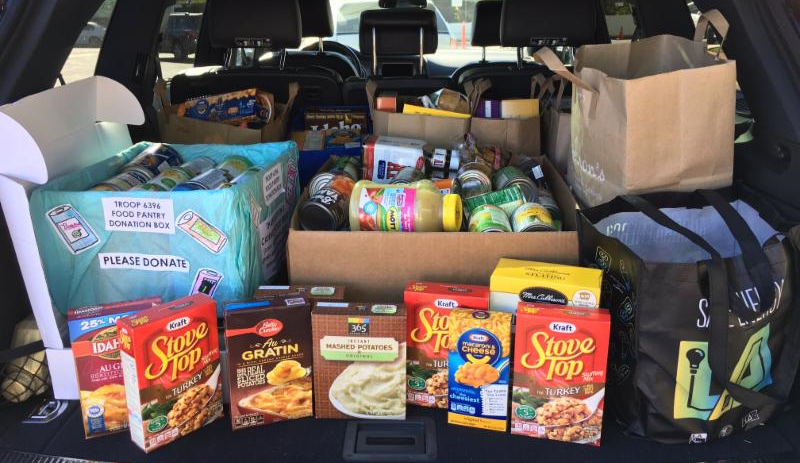 Thanksgiving Food Drive – organized by Troop 3696, Roscomare families collect food for the hungry before Thanksgiving – another great job in 2017! Way to go Girl Scouts! Hurricane Relief – Roscomare joined forces with Operation Gratitude, and collected and sent important toiletry items to disaster victims and first responders of the terrible hurricanes in the U.S. and Carribean in October 2017. SOVA – last year SOVA distributed over 2.5 million pounds of healthy, nutritious food to individuals of all ages, ethnicities and religions. Nearly 9,000 people benefit from this each month. Roscomare donated 2,347 pounds of food to support SOVA’s hunger relief program in 2017. Click here for the thank you letter. To learn more about SOVA, click here.